A smaller version of the original Affinity Dicer, like the Affinity, the Integra excels at processing challenging, difficult-to-cut applications such as cheese or soft meats, meats with high-fat content, cold temperature products, sticky bakery ingredients, or products like brined pickles. In addition to prevailing over challenging throughputs, the clean-cutting action achieves high yields of precise, targeted cut sizes well within customer parameters. This new dicer incorporates design elements from the longstanding Model RA series, the Affinity, and the Sprint® with the ability to replace existing in-line Model RA series machines. Consider the Affinity Integra to enhance your production capabilities. 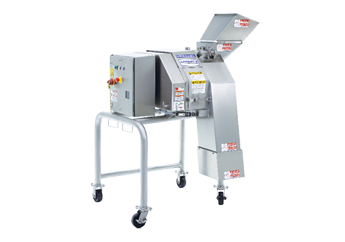 Compared to our standard Model RA-HD machine, this new dicer accepts a larger infeed product size combined with a larger impeller case that equates to potentially a 20 percent increase in yield; when compared to our standard RA-A, it equates to potentially a 50 percent yield increase. Increases vary per product, and free-of-charge test cutting of your product is encouraged to quantify achieved capacities. In addition, the Integra also offers greater overall design efficiencies.